Neurology is the branch of medicine concerned with the study and treatment of disorders of the nervous system, which includes the brain and spinal cord. 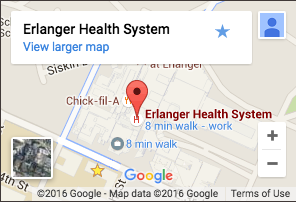 Erlanger’s neurology specialists treat adult and pediatric patients with a variety of neurological disorders ranging from common to complex. As the region’s only certified academic Neurosciences Center, we provide a comprehensive, multidisciplinary approach to care, giving our patients access to more specialty and subspecialty services than any area health system. Our neurology specialists use the latest advancements in imaging technology to accurately diagnose and develop individualized treatment plans, providing the best possible outcomes for our patients.